Art Battle Ottawa begins 2014 with a fun and inspiring night of live competitive painting at Arts Court on Wednesday January 15th. 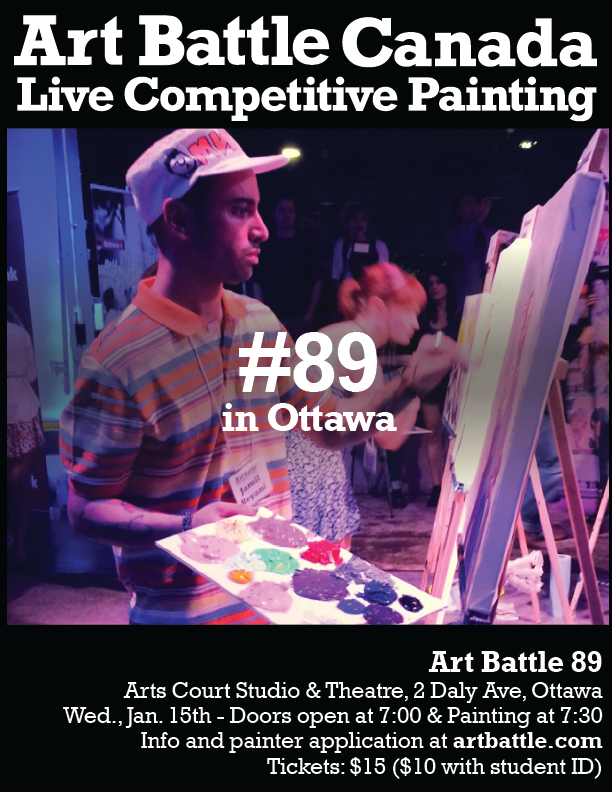 Art Battle Canada holds monthly events in more than a dozen cities across the country, and no where shows more spirit and support than the Capital! Art Battle is live competitive painting. Painters create the best work they can in 20 minutes. As they work, patrons move around the easels, closely watching the creative process. The medium is acrylic paint and the tools allowed are brushes, palette knives or any non-mechanical implements. At the end of the round, the audience votes democratically for their favourite painting and bids in silent auction to take the work home. This is Art Battle Canada’s 5th season and first full season.